Alexandria Taylor, a state representative candidate, demanded a recount of absentee ballots after many of them were rejected. Absentee voting is touted as an easy, convenient alternative to standing in long lines at the polling station. But what happens after you drop the ballot in the mail raises serious questions about the most fundamental promises of democracy, a Motor City Muckraker investigation has found. As many as tens of thousands of Michigan voters were disenfranchised in elections over the past year and were never notified that their absentee ballot was rejected, a practice deemed unconstitutional in at least six states since 2016. Unbeknownst to many voters, Michigan gives broad authority to local clerks and election boards to purge absentee ballots that do not appear to meet strict standards. One of the main reasons ballots are discarded is also one of the most subjective and disputed: Signatures on the ballots don’t appear to match those on file. Local election officials with no accountability or expertise in handwriting analysis are required by state law to toss out mismatched signatures. Never mind that signatures often change because of disabilities, injuries, sloppy handwriting or a lack of consistency. Signatures also can appear different based on whether voters are sitting or standing or what type of writing instrument they use. The rejection rate is much lower at the polls because voters are given a second ballot if they make an error. A University of Florida found that absentee ballots were 10 times more likely to be rejected than voters cast at polling locations. Unless addressed, more voters are likely to be disenfranchised in the November election because a record number of people – more than one-quarter – are expected to cast absentee ballots for governor, secretary of state, attorney general, state lawmakers and members of Congress. Several important measures also are on the ballot, including the legalization of marijuana for recreational use and no-reason absentee voting. In a close election, rejected absentee ballots can change the outcome. State law currently allows absentee voting for people who are 60 years or older, have disabilities or are going to be away from home during the election. Despite the potential of widespread disenfranchisement, the Michigan Secretary of State’s (SOS) office, which is the guardian of elections, does not even track the number of rejected ballots in most elections, said SOS spokesman Fred Woodham. The task of tabulating and recording the number of discarded votes belongs to hundreds of local clerks, the same ones tossing out ballots. That means clerks are policing themselves with no oversight. While the clerks are required to publicly disclose the number of discarded ballots and why they were rejected, none of the 10 municipal clerks reached for this story would disclose the information as required by the Michigan Bureau of Elections. The lack of transparency raises serious questions: How many ballots are rejected? Are some communities more likely to discard votes than others? Is there an effort to disqualify legitimate votes? Those questions have burdened Alexandria Taylor, an attorney and progressive Democrat who lost a state House seat over absentee ballots in the Aug. 7 primary. Just hours after the polls closed, Taylor went to sleep believing she had defeated Taylor City Council President Alex Garza for the 12th District seat, which covers Taylor, Romulus and Van Buren Township. But the day after some news outlets declared Taylor the winner, the final tally came in: Garza won by 10 percentage points. While Taylor won the election at the polls, Garza defeated her among absentee voters by a more than two-to-one margin. Suspicious, Taylor demanded a recount of absentee ballots in the city of Taylor, where the clerk supported Garza and even shared information with him about absentee ballots on Facebook. But the recount raised more questions than answers. Local election officials only recounted the ballots that were determined to be legitimate. They failed to review the rejected ballots or even disclose how many were discarded. So what happened to more than 1,000 absentee votes in the city of Taylor? No one knows except for the election officials who tossed out the ballots. This much the candidates know for sure: About one quarter of all absentee ballots were either tossed or did not include a vote for the state House race. Statewide, that number reached tens of thousands in the August primary and even more in the November general election. After the recount, Garza was declared the winner. 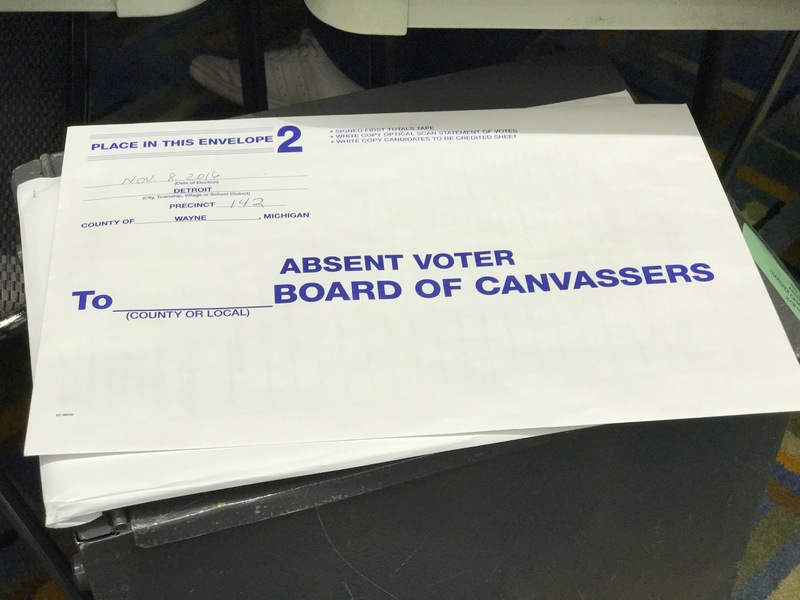 In an interview with Motor City Muckraker, Taylor City Clerk Cynthia Bower insisted she doesn’t keep track of rejected absentee ballots, despite a state law requiring her to do so. “I don’t know if our program is capable of doing that,” Bower said of the voting software. According to the Michigan Bureau of Elections, a branch of the Secretary of State’s office, local clerks are required to use electronic poll book (EPB) software that is part of the qualified voter file (QVF). The software is designed to keep track of every vote – and each rejected ballot – by precinct. Wayne County said it does not keep the information because it’s the responsibility of city and township clerks. This wasn’t the first time the city of Taylor had voting problems. A Wayne County judge overturned a 2016 school board election after discovering Taylor officials miscounted the write-in votes and improperly stored the ballots. Taylor, a political newcomer and mother of three, said the ordeal was demoralizing, but that’s not stopping her from continuing to fight for more transparency in elections. Taylor said clerks should notify voters when their ballots are discarded and give them a chance to challenge the rejection. In close races, rejected ballots can change the outcome. Take the presidential election in 2016, when 70,000 ballots in Detroit were either discarded or did not include a vote for president. Had those votes counted, Hillary Clinton would have defeated Donald Trump in Michigan. In an August 2014 primary, a state Senate race in Oakland County was decided by 177 votes, and more than 500 absentee ballots were rejected. In that election, the clerk said nearly 6,000 absentee ballots – or about 7% – were discarded for various reasons. “If 20%, or even 10%, of voters stood in line on Election Day and were turned away, there would be national outrage,” said Charles Stewart II, a political scientist at Massachusetts Institute of Technology, who discovered that millions of requested absentee ballots did not get counted nationwide during the 2000 presidential election. Without more transparency and a requirement for voters to challenge their discarded ballots, absentee voters are taking a leap of faith. In a related case, the ACLU of Michigan filed a federal lawsuit last month, claiming the state’s Bureau of Elections discarded genuine signatures for a ballot proposal because of the “standard-less and subjective practice in reviewing petition signatures.” After a closer look, the state eventually agreed there were enough legitimate signatures to place the issue on the ballot. “If the Bureau continues to use the same standard-less and subjective practice in reviewing petition signatures in the second sample, it will continue to reject genuine valid signatures as it did in the canvass of the first sample,” the suit claims.